Vinyl and polyurethane films have come a long way in recent years. Pictured above are two Porsches. The red one has a clear 8mil thick clear polyurethane film designed to protect the paint from debris on the road. These films can and will enhance the paint gloss and self heal from damaging bird bombs. Its biggest benefit? It keeps the paint from being chipped. The Porsche on the right has a printed vinyl film applied. This film will protect the paint but it’s biggest benefit is the look. It can completely change the color of your vehicle. 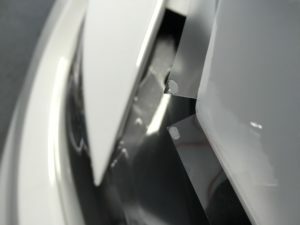 Vinyl film has been used for decades on vehicles. You’ve seen pinstripes on cars right? Well a lot of the time its a vinyl strip of film. Side strips and hood strips are also done with vinyl. 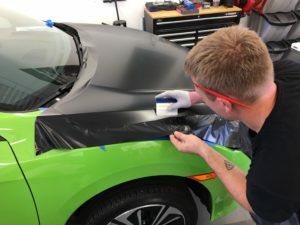 A big trend these days is to wrap your hood or roof in an accent color like we’ve done with this new lime green Honda Civic. Complete color change wraps are very popular as well. This customer wanted a satin black hood wrap to give the car a more aggressive look. When vinyl film is applied to a car it is stretched, heated and formed to the area it’s covering. It’s wrapped around edges and then trimmed giving a painted factory look. This film is only pre cut when doing strips and accent pieces. Polyurethane film also known as “Clear Bra” is typically pre cut on a plotter using a digital pattern. These patterns are numerous and can vary in several ways depending on variations in cars sub models. This film is stretched and formed to fit a cars contours. It’s applied wet using a soap and water mixture and a water and alcohol mixture. A good install will have the edges wrapped. This is what your seeing in the picture on the right. The extra film has not yet been wrapped around the edge of the hood. Wrapping the edges gives you a little more protection. The biggest factor it giving a cleaner looking installation.